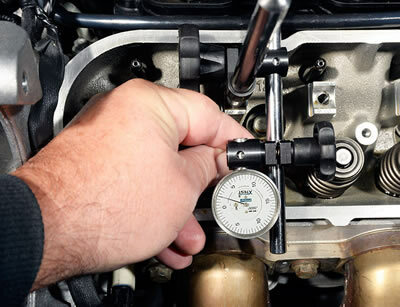 Let it be known: a “wiggle test”– measuring a Chevrolet V8’s valve stem-to-guide clearance with the heads on the engine–is not easy to accomplish. Done correctly, even for a professional service technician, it can be tedious, time consuming and even confusing at times. No doubt, DIYs are reading this. If that’s you, know that we made some assumptions: 1) you have the Factory Service Manual for your car to explain preliminaries to a wiggle test which are not detailed in this article, 2) you have experience with engine work such that you can disassemble then reassemble your engine’s valve train and 3) you have access to and operational knowledge of the proper tools and measuring equipment. If you don’t meet #2 and #3, let a Chevrolet dealer or independent service shop familiar with GM V8s do the work. Explanations of wiggle testing are posted in various places on the Internet and some are incorrect. Even the Factory Service Manual method is problematic in that, of the two drawings which show measurement of stem-to-guide clearance, the first shows a procedure which results in inaccurate measurements and the second, along with the manual’s instructional text, is impossible to duplicate on an LS7 head. Finally, if the measuring gear is not set-up and used properly, you risk inaccuracy. Such errors may have you decide a valve guide is worn when it is not. The suggestions in this article will result in the most accurate wiggle testing possible. Hib Halverson Hib Halverson is an automotive writer and content supplier for print and internet media.